1) Areivim USA’s goal is to assist families in which a parent has passed away and unmarried children under the age of thirty five are left to struggle financially. The program was designed by Rabbonim and askanim who recognized that the mass fundraising campaigns which are commonly used in these situations are no longer acceptable. Bereaved families were subject to humiliation as their plight was publicized. The cost of these fundraising efforts, which included appeals, parlor meetings, advertising, printing, and mailing, were prohibitive; and the results were usually disappointing. Areivim USA presents a better and a more efficient alternative. 2) Our goal is to raise a fund of up to $100,000 for each unmarried child, and for every widow/widower left with three or more unmarried children. 3) The funds are placed into secure accounts where they are saved and used for the family’s expenses. 4) Areivim USA is not life insurance. Areivim USA has been established primarily as a charitable endeavor and its halachic status is like that of all tzedakah money collected from the public. In the event of a the passing of a member r”l, all contributions can be made with maaser money. 5) In the event of (G-d forbid) a large number of deaths among members (as a result of a war, an earthquake, etc. 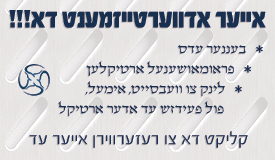 ), Areivim USA reserves the right to consult with its Rabbinical Board on proper procedures. 6) Members have no rights to sue or submit legal claims against the decisions of Areivim USA or its Rabbinical Board, including for failure to initiate a collection. There are no oral agreements or other commitments between Areivim USA and its members, and no such oral agreements or commitments shall be given any legal effect. 7) Any application found to have false information, or that does not meet the terms and conditions of Areivim USA, will retroactively disqualify applicant from Areivim USA. Past contributions will not be returned. 8) Residents of Israel are excluded from membership in Areivim USA. 9) Acceptance in Areivim USA is based on the family’s commitment to Torah and Mitzvos. 10) All families wishing to register must complete and sign an Areivim USA application with credit card or banking information. 11) There is no sign-up fee to join Areivim and there are no mandatory charges. Contributions will be solicited in the event of the passing of a member r”l. 12) Each family is considered one unit. In the event of the passing of either husband or wife, Areivim USA will initiate its evaluation process on behalf of the family. Widows, divorcees and single parents are also eligible to join. 13) In order that the Areivim USA contributors are not overburdened, the Rabbinical Board of Areivim USA has determined that collections will not be undertaken on behalf of survivors of members who were in ill health when they applied for membership. An applicant with a pre-existing significant medical issue may still contribute to Areivim USA by filling out the Program Registration Form and inserting a desired donation amount per orphan. Areivim USA also reserves the right to request medical records of a member in the case of his/her passing, to determine whether a fund should be collected. 14) Membership begins immediately after approval is granted. Members pledge to contribute to all appeals after their acceptance, unless they opt out of donating. Upon acceptance into the program, registrants will be sent a certificate with a personal membership number. 15) Membership may be acquired as a gift providing this is specified in advance. For example, parents may register their married children in the program and contribute in their stead. Friends may also register each other. This should be noted on the Program Registration Form. 16) Membership in Areivim USA is nontransferable and may not be passed on through inheritance. 17) Members will always be notified prior to any collection by Areivim USA, via contact information they have provided to Areivim USA in writing. 18) It is the responsibility of members to keep us updated with any changes to their contact details or bank/credit card information. 19) Membership rights may be terminated at any time if pledges are not paid in a timely fashion. 20) The full collection of $100,000 per orphan is based on the membership of approximately 14,500 families which constitutes the group. In the event that a member’s death occurs before the group is complete, the collection total will be adjusted downward accordingly. 21) Areivim USA will determine the exact amount of funds raised and distributed per orphan based on an evaluation of the needs of the orphaned child through a set of criteria consistently applied. 22) In all cases of dispute, Areivim USA will call upon its Rabbinical Board to serve as arbitrators. Their decision will be accepted as final. 23) Applicants commit themselves to all terms and conditions by signing the application. 24) In the event of the death of a member of Areivim USA r”l, each family will be asked to contribute a one-time sum of up to seven dollars for each eligible orphan and widow/widower of the bereaved family. 25) To maintain their membership Areivim USA members will never be asked to contribute more than twenty eight dollars in any given month. This will provide for the needs of four family members. In the event that there are more orphans in the family, the remaining funds will be collected the following month. 26) The goal is to establish funds of up to $100,000 per orphan. If more people than the number required to reach that goal join, the amount of assistance collected from each member decreases. 27) The bereaved family’s funds will be overseen and distributed by a board comprised of an Areivim USA representative, a representative of the family, and the family’s Rav. 28) Those who financially wouldn’t need the support of Areivim USA or who otherwise wouldn’t qualify for Areivim USA membership, but wish to contribute to Areivim USA as a means of helping to alleviate the plight of orphans in our community, may contribute by filling out the attached Program Registration Form and inserting the desired donation sum per orphan. Such a donor may choose to pledge any amount per orphan. איינער ווייסט אויב מ'קען נעמען די געלט פון מעשר? גאפל האט געשריבן: איינער ווייסט אויב מ'קען נעמען די געלט פון מעשר? יעדע קרן יתומים לויפט אלץ מיט חתונה מאכן, כ'האב שוין גע'עסק'נט בענינים אלו מיט גדולי הרבנים נאך פאר ערבים. It is with great pain that we notify you of the recent untimely Petirah of an Areivim USA member, from Monroe, New York, leaving behind a widower and three orphans R"L.
Therefore Areivim USA members are requested to donate in the month of January. The credit cards and bank accounts of members will be debited Iy”h on or about Tuesday, January 1st IYH. Your card/account ending in 0000, will be debited in the amount of $28 on the above date. Please make sure this card/account is still valid. In the case it is not valid, or you would like to change the payment method, please contact us no later than Monday December 31st with the correct information. If you do not wish to donate, please call us by December 31, or we will assume that you want us to charge the account we have on file for the above amount. In the zechus of of supporting almonos & yesomim in a respectful and discreet manner, may we all be spared any sorrow and may our services speedily become obsolete. 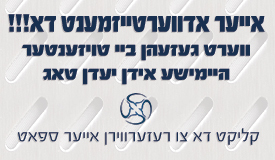 א נאמען פון די דיין וואס איז אחראי און פון וועלכע שטאט ס'געשען. בערל קראקאווער האט געשריבן: ליידער געווארן לעצטנ׳ס חודש׳ליך. ג"א מצטרף, ס'האלט די מענטשן אינפארמירט!